Jonathan Gottschall – Life moves pretty fast. I thought this was a brilliant question for Edge.org: What scientific idea is ready for retirement? Fifteen thousand years ago in France, a sculptor swam and slithered almost a kilometre down into a mountain cave. Using clay, the artist shaped a big bull rearing up to mount a cow, and then left his creation in the bowels of the earth. 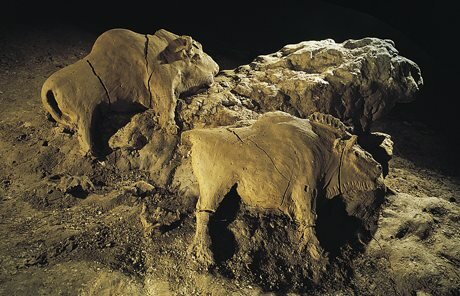 The two bison of the Tuc D’Audoubert caves sat undisturbed for many thousands of years until they were rediscovered by spelunking boys [cavers] in 1912. The discovery of the clay bison was one of many shocking 20th-century discoveries of sophisticated cave art stretching back tens of thousands of years. The discoveries overturned our sense of what our caveman ancestors were like. They were not furry, grunting troglodytes. They had artistic souls. They showed us that humans are – by nature, not just by culture – art-making, art-consuming, art-addicted apes. But why? Why did the sculptor burrow into the earth, make art, and leave it there in the dark? And why does art exist in the first place? Scholars have spun a lot of stories in answer to such questions, but the truth is that we really don’t know. And here’s one reason why: science is lying down on the job.